China North Industries Corporation (NORINCO) has developed new variants of its export-oriented 8x8 VP10 armoured personnel carrier (APC), Jane's has learnt. The baseline VP10 APC is typically operated by a two-person crew, and carries up to 12 dismounts in the rear troop compartment. The vehicle is equipped with a small roof-mounted remote weapon station (RWS) armed with a 12.7 mm machine gun (MG). The VP10 APC is also understood from its original unveiling to be fully amphibious, with two shrouded propellers – mounted either side at the rear of the hull – that propel the vehicle in water at a maximum speed of 8 km/h. NORINCO has disclosed a new variant fitted with a turret-mounted 105 mm rifled gun. The gun features a muzzle brake and fume extractor, though it lacks a muzzle reference system or thermal sleeve. The gun is laid onto the target by a computerised fire control system (FCS), with commander and gunner using stabilised sighting systems. Secondary armament comprises a 7.62 mm coaxial MG, with banks of electrically operated 76 mm grenade launchers mounted on the roof and firing forwards. It is currently unknown whether the 105 mm rifled gun is manually loaded, or fed by a bustle-mounted automatic loader. The first example of the 105 mm-gun variant does not appear to be amphibious, as it has an increased gross vehicle weight (GVW) owing to the installation of the heavier turret; in addition, the vehicle has not been fitted with propellers. The 105 mm-gun variant is fitted with appliqué passive armour package to the hull and turret, and a number of dismounts could be carried in the rear troop compartment, which is fitted with firing ports and associated vision devices. This is gross and obscene. 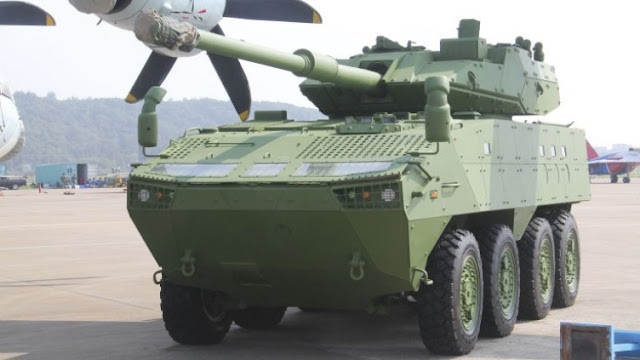 The Chinese have no shame and they've obviously cloned the Patria AMV. Is the threat from China overstated? I don't think so. I do believe that they are willing to do whatever it takes to move ahead...even stealing foreign designs. It's apparent that they lack innovation and imagination. That could be our saving grace. Unless they change course then they will always be behind on the technological curve. There is a problem though. Mass means something. If they stay behind technologically but are able to produce at a high rate then they still could win.